Angus & Robertson (A&R) is a major Australian bookseller, book publisher and book printer. As book publishers, A&R has contributed substantially to the promotion and development of Australian literature. This well known Australian brand currently exists as an online shop as part of online bookseller Booktopia. The Angus & Robertson imprint is still seen in books published by HarperCollins, a News Corporation company. 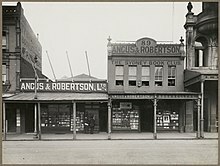 Angus and Robertson booksellers, 89 Castlereagh Street, Sydney, 1915. The first bookstore was opened in 110½ Market Street, Sydney by Scotsman David Angus in 1884; it initially sold only secondhand books. In 1886, he went into partnership with fellow Scot George Robertson. This George Robertson should not be confused with his older contemporary, George Robertson the Melbourne bookseller, who later traded as Robertson & Mullens. In 1900, David Angus, plagued by ill health, retired from the partnership to England, where he died soon after. Frederick Wymark took over a large portion of Angus's share in the company. In 1895 the company moved to 89 Castlereagh Street, Sydney. The head office of the firm was at Castlereagh Street until the 1950s. The shop was known as the "biggest bookshop in the world". In 1907 the partnership was converted into a public company: Angus & Robertson Limited. In 1951 a store was established in High Commission of Australia, London, which operated until the 1970s. As a publisher, Angus & Robertson has played a substantial role in shaping Australian literature by publishing, to huge sales, works by popular Australian authors such as Banjo Paterson, Henry Lawson, C. J. Dennis, Norman Lindsay, Frank Clune, Ion Idriess, Will H. Ogilvie, Colin Simpson, Arthur Upfield, Frank Dalby Davison, E. V. Timms, and children's writers Dorothy Wall and May Gibbs. From time to time, Angus & Robertson has offered substantial support to literary societies. For example, it published the literary journal "Southerly" for some years. A&R has also provided incentives for promising Australian writers. For example, A&R frequently applied for federal grants to subsidise the publication of worthwhile but limited-market books. In 1993, the first A&R Bookworld Prize of $10,000 was awarded for a first book of fiction by an unpublished writer. In the 1960s, a battle for control of Angus & Robertson commenced, based on its extensive property holdings. Scottish publisher William Collins bought a significant defensive shareholding, acting on behalf of worried British publishers, as A&R comprised a significant proportion of their Australian sales. In 1970, entrepreneur Gordon Barton, via his Ipec transport company, made a takeover offer, and soon had effective control. Many of the old staff resigned, and a long period of rapid change followed, in which mass-market books became increasingly preferred, instead of high-brow literature. Richard Walsh was managing director and publisher for 14 years (1972 to 1986). In 1981 A&R was purchased by News Limited. Since 1977, the publisher has been a separate company under separate ownership from the bookseller. In 1989, Angus & Robertson Publishing was included in the merger of William Collins and Harper & Row, to form HarperCollins. Ownership of the company has changed several times since the 1970s. In 1978, the retail bookselling arm was purchased by Gordon & Gotch who invested substantial funds in upgrading and expanding the stores, including a major new store in Sydney's Imperial Arcade. When Gordon & Gotch was taken over by Herald & Weekly Times the business was sold to music retailer Brashs who also bought Terry Herbert's Queensland-based Bookworld. For several years the company went by the name Angus & Robertson Bookworld before eventually dropping Bookworld as part of the name. Ownership of the company then passed on to Whitcoulls which was itself later purchased by WH Smith in 2001. From 2009, Angus & Robertson was under the portfolio of REDgroup Retail, a retail operations company owned by Pacific Equity Partners, a private equity company, which loaded A&R with large debts. In February 2011, REDGroup (including the Borders, Angus & Robertson and Whitcoulls chains) were placed into administration. Retail stores were closed, and the website was sold to media conglomerate Pearson, which also owns Penguin Books, and operations were moved from Sydney to Melbourne. In 2012 the Borders website was rebranded "Bookworld", but the Angus & Robertson website (still widely known) was retained as a clone of Bookworld. The chain of remainder bookshops named A&R Bargain Books is not connected to Angus & Robertson. ^ a b Alison, Jennifer (2001). "Publishers and editors: Angus & Robertson, 1888–1945". In: The History of the Book in Australia 1891–1945. (Edited by Martyn Lyons & John Arnold), pp. 27–36. St Lucia: University of Queensland Press. ^ Alison, Jennifer (2009). Doing Something for Australia: George Robertson and the early years of Angus & Robertson, Publishers, 1888–1900. Bibliographical Society of Australia and New Zealand Occasional Publication no 9. ^ Barker, A. W. (editor) (1982). Dear Robertson: Letters to an Australian publisher. Sydney: Angus & Robertson. ISBN 0207146683. ^ Kent, Jacqueline (2002). A Certain Style: Beatrice Davis, a Literary Life. Melbourne: Penguin Books. ISBN 0143000675. Davis was the senior editor at A&R for many years. ^ "Angus & Robertson". State Library of New South Wales. Archived from the original on 23 May 2006. Retrieved 6 July 2006. ^ Wymark, Marjorie. "Wymark, Frederick Victor Grey (1872–1942)". Australian Dictionary of Biography. Canberra: Australian National University. Retrieved 2012-02-18. ^ "15. Q. I have a question about Angus & Robertson Publishers and 16. Q. What's the history of Angus & Robertson?". Frequently Asked Questions. Angus and Robertson. Retrieved 6 July 2006. ^ "About Angus and Robertson". Angus and Robertson. Archived from the original on 23 August 2006. Retrieved 6 July 2006. ^ The Sydney Book Club. Fragment [Angus & Robertson house magazine], no 11, p. 6 (June, 1959). ^ Everingham, Sam (2009). Gordon Barton: Australia's Maverick Entrepreneur. Sydney: Allen & Unwin. ISBN 978-1741-752434. ^ Greenblat, Eli (17 February 2011). "Borders, Angus & Robertson go bust". The Age. Retrieved 17 February 2011. ^ "Borders, Angus & Robertson websites snapped up by educational publisher Pearson Australia". ^ "Tome raider: Booktopia buys Bookworld and Angus & Robertson". smartcompany.com.au. 3 August 2015. ^ ""Angus & Robertson throws the book at publishers". Crikey. August 30, 2007. Archived from the original on August 30, 2007. ^ "Angus & Robertson setting the record straight". Crikey. August 30, 2007. Archived from the original on August 30, 2007.